This recipe is crazy easy to throw together, and you won’t believe how great it tastes!! It is a staple in our house, serving as an excellent side dish for red lentil dahl (last post). Both dishes heat up well for lunches the next day. To make this dish a main course, you can add a bag of frozen edamame to it. A side salad topped with cumin powder, lemon juice, and salt is nice alongside it. 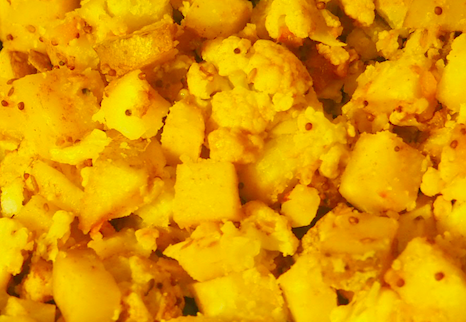 Chop up the potatoes, cauliflower, and tomatoes, and put the pieces into one large bowl. Add the whole seeds, turmeric, and salt. Transfer to a roasting pan with a cover (or use foil). Bake 40 min or until vegetables are soft. You might want to stir once during roasting so that you get even cooking. 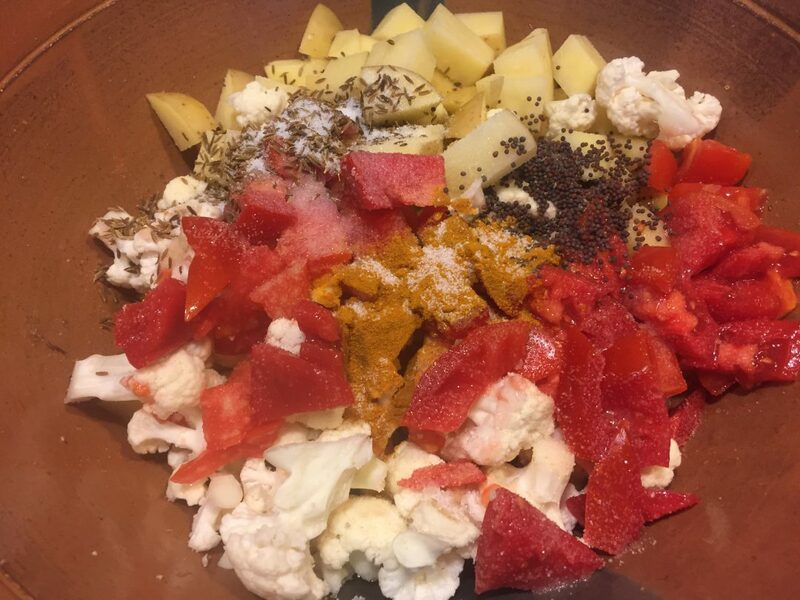 Each of the six servings (123 calories each, with lots of vitamins thanks to the cauliflower and tomato) for this recipe has 76 g CO2-eq associated with it. 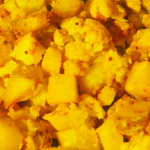 (The potatoes, cauliflower, tomatoes, and seeds contribute 21, 38, 9, and 8 g CO2-eq/serving, respectively.) If you used hothouse tomatoes, the contribution from the tomatoes alone would be 159 g CO2-eq, and the new total would be 226 g CO2-eq!! For comparison, one medium baked potato topped with onion and margarine would have a footprint of 67 g CO2-eq, while a potato with sour cream, butter, and cheese would have 534 g CO2-eq associated with it. Just one portion of switching from the more loaded potato to the aloo ghobi with field production tomatoes saves the amount of gas used to drive a car two miles. Notes on sources of data: Nutritional info is from the USDA Food Composition Database, and greenhouse gas emissions conversion factors all items except tomatoes are from Heller and Keoleian 2015. Conversion factors for various production styles of tomatoes are from Heller et al. 2013. Seeds and nuts are assumed to be in the same category, as in Meier and Christen 2013. CO2-eq includes greenhouse gases other than carbon dioxide (such as methane), expressed in terms of the warming potential of CO2. Note on recipe: I originally learned to make aloo ghobi from Anand and Nisha Patel—a big thank you to these great chefs!! Their recipe involves roasting the seeds in oil, and cooking the potatoes and cauliflower on the stove top. It is fantastically delicious done this way. For this recipe, I added tomato for some liquid while roasting, and I toss it all together into the oven just in the interest of simplicity. Heller, M.C. and G.A. Keoleian. 2015. Greenhouse gas emission estimates of U.S. dietary choices and food loss. Journal of Industrial Ecology. 19(3): 391-401. Heller, M.C., G.A. Keoleian., and W. C. Willett. 2013. Toward a Life Cycle-Based, Diet-level Framework for Food Environmental Impact and Nutritional Quality Assessment: A Critical Review. Environmental Science and Technology, 47, 12632−12647. Meier, T., and O. Christen. 2013. Environmental Impacts of Dietary Recommendations and Dietary Styles: Germany As an Example. Environmental Science and Technology, 47, 877−888. This is a wonderful dish, even if, like for me, cauliflower is a yet to be acquired taste. Add some dahl and Nan — and enjoy. I like doing this one by softening the potatoes and cauliflower in the microwave first then sautéing onions and spices and adding the veggies to the pan on the stove top. Delish! It’s been a once a week meal for many many years.